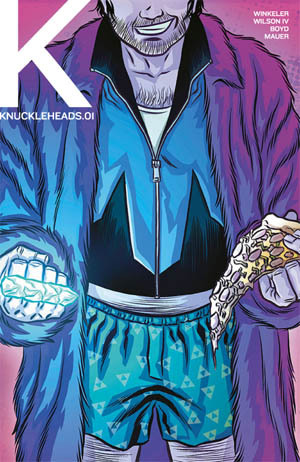 Cosmic Treadmill: 'KNUCKLEHEADS' (comic review) - at Forces Of Geek! Bill & Ted. Jay & Silent Bob. Han & Chewie. Monkeybrain & ComiXology. True friendships are golden through and through. Trevor K. Trevinski and Lance Powers are roommates who do normal roommate things like watch Cake Boss marathons on Netflix, play video games and eat pizza. The difference from most of us is, aliens have bestowed a crystal fist to Trevor, allowing him the power cosmic to cheat on GTA: 5 and maybe even fight some bad guys. The latest digital comic series from Monkeybrain has been released on ComiXology and we’ve taken a look on this Cosmic Treadmill. We’re finally here, when the digital comic can get its due. We’ve been reviewing ComiXology Submit titles and when appropriate also digital titles from the Big Two. With so many people reading on their devices these days (including the PC or laptop computer, with ComiXology in a browser) the market has changed from fearing the digital format in the post-iPad world in only a couple of years. ComiXology itself, along with Amazon has encouraged and allowed creators to submit works to the platform. Smart, forward thinking imprints like Chris Roberson and Allison Baker’s Monkeybrain Comics as well as Mark Waid’s Thrillbent have also provided a home and for these great digital comics from known and unknown creators, forging the way in the digital space for an almost Image Comics-esque revolution.